At Eden, Man, through his own distrust of God and selfishness, fell into Sin. Tainted by the inborn selfishness of Original Sin, Man has struggled, plagued by Satan and Sin, reaping the harvest of pain and suffering. Since then, Man has hoped and prayed for salvation to lift him from the depths of sin and isolation from God. Man, selfish, desperate and confused, has been seduced by an increasingly secular society that promises the Utopia of the “good life.” Politicians, academics, activists, scientists, businesses and the media promise happiness through the works of Man. Falling for false idols, many seek their salvation through the promises of these secular powers and by running on the never-ending hedonistic treadmill of consumption of worldly things. But “Utopia” literally means “no place”. So despite the promises of the secular “utopia”, Man remains mired in the Lowlands of Sin. The descent into Sin is evident in the lives of ordinary people: violence, gluttony, sexual promiscuity and perversion, broken relationships and broken marriages, rebellion against Natural Law, life rejected through contra-ception (literally, “against life”), children aborted or abandoned, addictions of every sort and lives wasted on frivolous pursuits. Man is mired in the Lowlands, unable to lift himself from the effects of Original Sin. Through His Resurrection, opens up a new life for all humans – “By His Resurrection, He opens for us the way to a new life…[a] new life that is above all justification that reinstates us in God’s Grace…[and] we too might walk in the newness of life…[and we] become Christ’s brethren” (CCC 654). 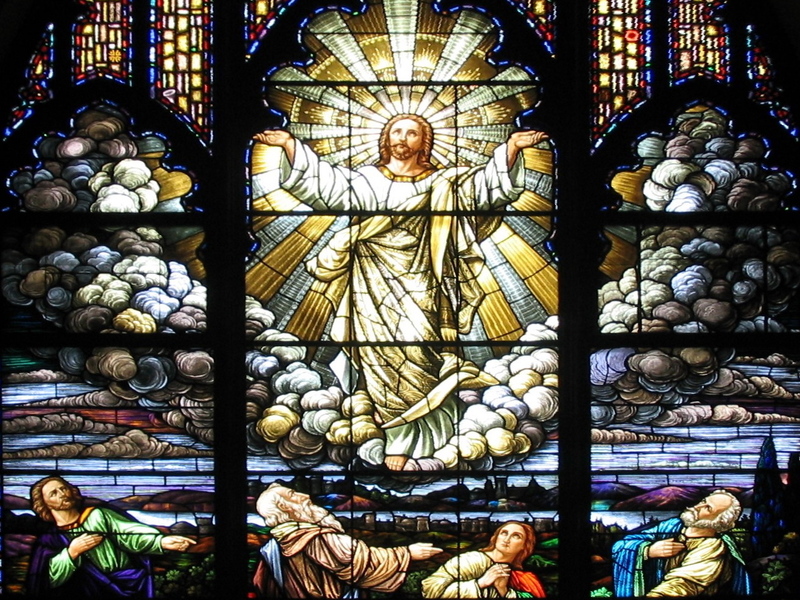 Appears with His Resurrected body – Jesus’ “real body possesses the new properties of a glorious body: not limited by space and time but able to be present how and when He wills…” (CCC 645). He can disguise and reveal His appearance at will (Luke 24:16; John 20:14,19). He can appear and disappear at will (Luke 24:31). He eats and drinks (Acts 10:41) and allows others to touch Him (John 20:27). On the day of the Resurrection, He walks about 6 miles to Emmaus, shares a meal and teaches for an extended period. During this time, Jesus’ glory remains veiled under the appearance of ordinary humanity (CCC 659). Spends 40 days with the Apostles – After the Resurrection, Jesus appears multiple times to Peter and John, the Apostles, Mary Magdalene (Mark 16:9; John 20:11-16), the disciples on the road to Emmaus, and five hundred disciples (and to Paul after the Ascension) (1 Cor 15:5-8). Reveals the fullness of Salvation History – At Emmaus, Jesus explains the meaning of the Old Testament to the disciples, filling them with awe (Luke 24:32). The Incarnation reveals that the hidden meaning of the Old Testament is the dying of the Savior for our sins (1 Cor 15:3). Predicts His Ascension – Jesus predicts His ascension prior to His Passion: “[Y]ou shall see the Son of Man ascend up where He was before…” (John 6:63). Jesus predicts His Ascension after the Resurrection, saying to Mary Magdalene: “Do not touch Me, for I am not yet ascended to My Father..” (John 20:17). Ascends into the heavens on clouds at Mt. Olivet on Ascension Thursday – 40 days after the Resurrection, Jesus gathers the Apostles together at Mt. Olivet, less than a half-mile east of Jerusalem (Acts 1:12). In the presence of the Apostles, Christ rises into the heavens in a cloud, representative of Divine Presence in general (Exod 13:21, 24:16) and the Holy Spirit in particular (Isa 63:11; CCC 697). He ascends in Spirit and Body by His own Divine Power (CCC 663). Takes His place at the right hand of the Father – Christ’s return to the Father echoes Daniel’s vision (Dan 7:13) in which the Messianic Son of Man is carried to the Ancient of Days on the clouds of heaven; interestingly, Jesus appears again to Stephen as the Heavenly Son of Man standing at the right hand of the Father (Acts 7:55-56). He continues to reign in Heaven (Rev 1:12-18, 3:21,6:1-7, 7:17) in power and glory and honor (CCC 663). “To say that He was taken up or that He ascended, does not necessarily imply that they locate heaven directly above the earth; no more than the words “sitteth on the right hand of God” mean that this is His actual posture” (Source: Catholic Encyclopedia). Inaugurates the Kingdom – Being seated at the right hand of the Father signifies the inauguration of the Messiah’s kingdom, the fulfillment of the “Kingdom [that] will have no end” (CCC 664). He reigns as king (CCC 664) and priest and intercedes for “those who draw near God through Him” (CCC 662; Heb 7:25). As King, Jesus rules above all things (Eph 1:21). He has prepared a place for the faithful (John 14:3). Sends the Holy Spirit – Ten days after His Ascension, at Pentecost (Acts 2), Jesus’ promise to send the Holy Spirit (John 14:16; 15:26, 16:7) is fulfilled. It is in sending the Holy Spirit that Jesus inaugurates the Age of the Spirit and the Age of the Church. The Holy Spirit is sometimes referred to as the Spirit of Jesus (Acts 15:7). Jesus continues to intercede for Man by assuring a permanent outpouring of the Holy Spirit (CCC 667). The Holy Spirit works within the Church (Acts 4:29-21, 13:1-3, 16:6-10). Maintains His Presence with the Church – Though Christ has withdrawn His physical visible presence, Jesus continues to live and work through the ministry of the pilgrim Church (Matt 18:20, 28:20; Gal 2:20) animated by the Holy Spirit (Acts 2:4; CCC 659). Promises to return to take the faithful into Heaven – After the Ascension, two heavenly men in white robes promise the Apostles that “Jesus, who was taken up from you into heaven, will come in the same way as you have saw him go into heaven” (Acts 1:11). The same cloud that took Jesus away will bring Him back to retrieve the saints who are destined for glory (1 Thess 4:14-17). Indeed, the Church’s earliest creeds affirm that Christ will come again to judge the living and the dead (CCC 678-79).